The sun has come out—after 3 more inches of rain | Where to next? Canberra has had 8 inches of rain in less than three days, and this was after some soaking rains earlier this year. We’ve had so much rain in recent times that people are beginning to wonder if Lake George might refill this year. This lake has mythical properties. It seems to fill and empty without warning, and many speculate that it might be connected somehow to Peru or South Africa. It’s been pretty much dry since 2002. It was also quite dry in 1982, when I first arrived in a drought-stricken Australia, but it filled the following year. When full, it’s shallow, salty and treacherous. It’s Indigenous name of Werriwa means ‘bad water’. In the past, boats have overturned and the bodies of the missing fisherman have never been found. But I digress. Yesterday I shared some pics of the flood debris on the shores of Lake Burley Griffin. 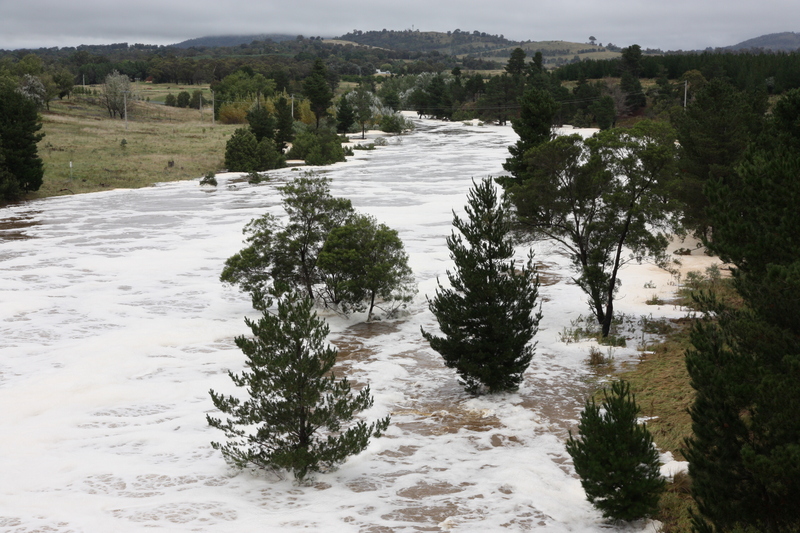 Today Poor John and I went to Scrivener Dam (at the east end of the lake) to watch the water crashing into the Molonglo River. The buoys on Lake Burley Griffin hauled in for their own safety. Wow, there’s some impressive and thundering force there. 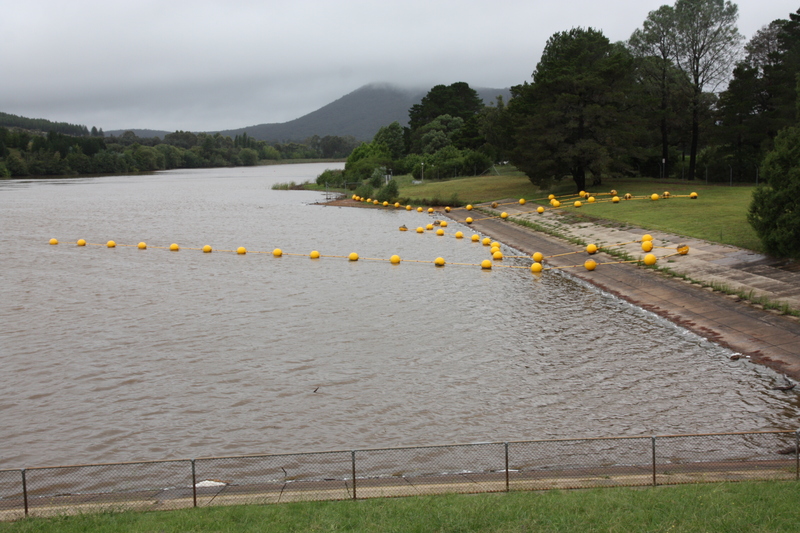 The city moved the buoys that usually alert people that they are getting too close to the dam wall. That was, no doubt, to save the buoy line from being destroyed and to let passing branches and other rubbish spill over. Three of the five sluice gates were wide open, creating a rarely-seen local waterfall and an instant tourist destination. They should have charged admission. Crowds gathered on both sides of the river and on the bridge as well. The southern carpark holds about 30 cars, and every space was taken. Plus, plenty of cars were parked on the grass and on the roadway verge. I visited twice, and a steady stream of spectators just kept coming. The sun finally reappeared in the late afternoon—just a glimpse before dusk set in. Tomorrow is supposed to be sunny, warm and soggy. I had no idea my finger-crossings were answered so promptly, but delighted to hear you’re getting some rain. I can’t believe how much rain there were over there. It’s been really nice in Adelaide. Hi Peggy, I am soooo excited to see you!!!!!!!! We’re excited too. Won’t be long. Gurgle, slosh, squelch—Canberra under water « Where to next?